Today will feature cloudy skies, a stiff East wind, cold temps, and the chance for rain. The high pressure system that we have been enjoying for the past few days is moving out into the Atlantic and the storm that brought snow to the Dakotas, freezing rain to Duluth, over a foot of rain in Pensacola, extreme fire conditions in SE CO, and of course the tornadoes in the south, is moving in. We will not experience any of the many many things the storm did to other areas, but we will get a couple of less than perfect days out of it. Rain moves into NH and western ME today but as our high pressure mounts one final stand, dry air should eat away at the leading edge of the precip so expect a mostly dry day east of Portland. Tomorrow we get the rain in full force with heavy showers passing through all day long. Temps will be mild though in the 50’s and 60’s with 70’s possible in southern areas. Used RADAR/HRRR/NAM/GFS for precip, SAT/NAM/GFS for clouds. MAV/MET was a good blend for temps matching up well with obs. Went over guidence in Central VT as highs in the mid 30’s seemed too cold for a setup like this. Today will feature the last mainly cloud free day for nearly a week. Highs will be near 50 at the coast and in the mid 50’s inland. A stiff onshore wind will keep the coast cooler. The wind will also make it feel a lot colder than it actually is. East winds could gust over 20 mph. So how did we do yesterday? We did all right. 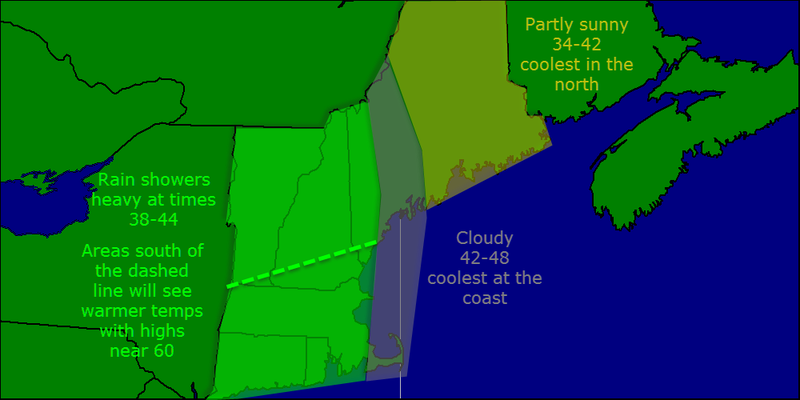 Of course, I would love to have done better but here’s how our forecast compared to actual observations. Temps: Only off by a degree or two. Since we don’t forecast specific temps for specific locations (Yet), this one is hard to compare but we called for low 50’s whereas the high at Portland was 54. We overdid the winds a bit for most though the Jetport observations lined up nicely with our forecast. We called for 20-25 MPH winds when numerous gusts in that range were reported throughout the day yesterday. We did nicely on the clouds with overcast skies dominating yesterdays weather. Today will feature cloudy and cold conditions as low pressure lurks nearby. Winds will be gustiest this morning approaching 25 mph out of the North. Clouds will also be abundant so that will limit heating as well. Highs will top out in the upper 40’s to low 50’s. 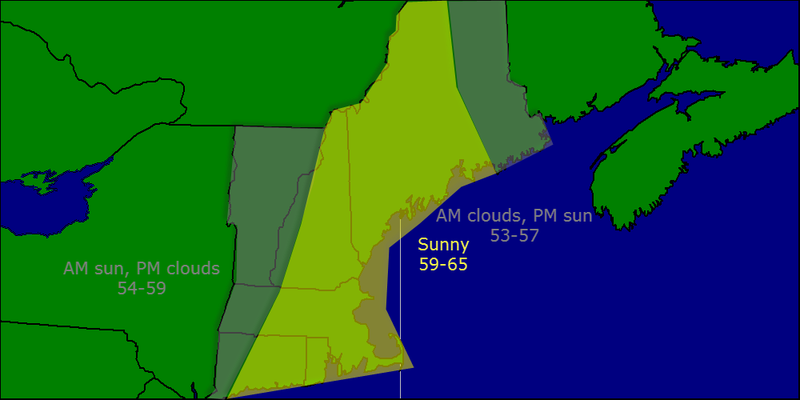 The best chance for sun is on the coastal plain as well as western and southern areas. 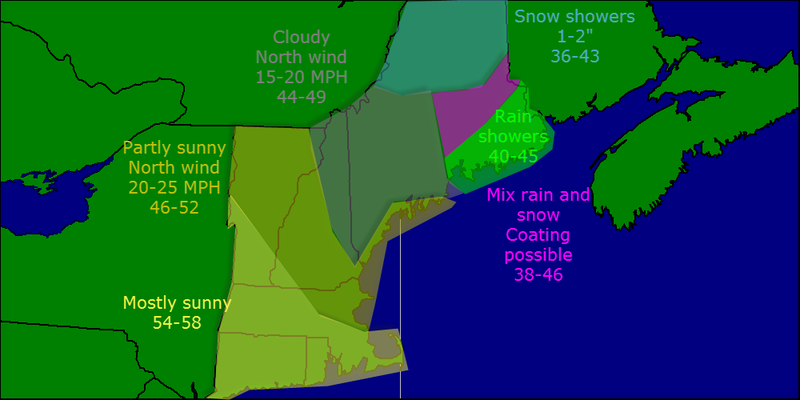 Our weather however is pretty good compared to the snow falling across Downeast Maine. 1-2″ is expected. Used GFS mainly for clouds as NAM was too conservative for synoptic setup. Went under model guidance for temps in areas with copious could cover as lack of diurnal heating will hurt highs. Radar/SPC meso was used for precip/Ptype. Any leftover showers move out this evening leaving cloudy and cool conditions tonight into tomorrow morning. Clouds slowly move out tomorrow with partly sunny skies by afternoon. Highs will be cool but not cold in the low 50’s. Tuesday looks to be the pick of the week with mostly sunny skies and temps in the low 50’s at the coast and upper 50’s to near 60 inland. Clouds increase again Wednesday as our next storms rolls in. Winds will be stiff out of the east so highs will struggle into the low 40’s. 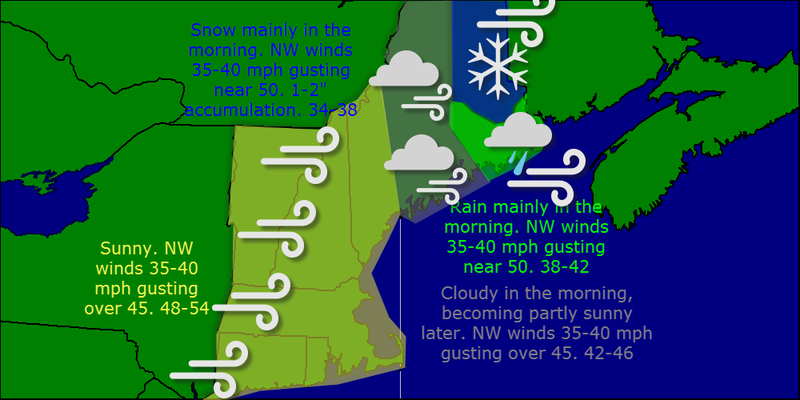 A raw day is in store for Thursday with rain possibly heavy at times as well as a strong ENE wind and temps in the 40’s. Heavy rain moves out Friday with lingering showers, clouds, and cold temps. Highs rebound into the 50’s. The weekend looks cloudy but mainly dry. Temps will be warmer near 60. Similar to this weekend, there will be plenty of dry hours that will get pinned down as time goes on. Today will feature the best day of the week in every regard. First off, it’s Friday so tomorrow is the weekend but also, the weather will be spectacular. For almost the entire day today we will see sun and temps in the 60’s despite a chilly start. Some clouds are still lingering over eastern sections from yesterday’s storm (Caribou got 3″ of SNOW) but those will be quick to head offshore. A few high clouds could filter in from the west ahead of our next system. The mid to low level deck should nudge into VT and western MA, NH, and CT this afternoon so watch for cloudy conditions to develop there. Today will feature varying conditions depending on your location. 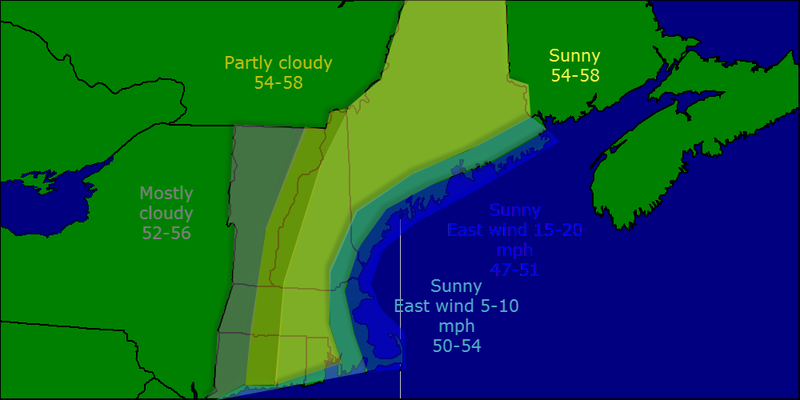 Far NE sections will be a wind blown couple inches of snow whereas most other areas see sun, 50’s, and a little wind. Winds will gust near 50 mph today as we are sandwiched between a 1024 mb high pressure system in the Great Lakes, and a 987 mb low over Nova Scotia. Used NAM/GFS/OBS for temps, Satellite/NAM/GFS blend for clouds, radar/SPC meso for precip/ptype. Winds came from NAM/GFS/OBS/WPC guidence. Winds will pick up out of the NW this afternoon bringing in cooler air. Tomorrow will also be blustery with winds gusting over 30 mph at times.